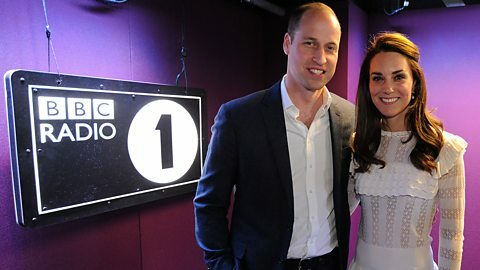 We have a lot of guests through the Radio 1 studios but it's not every day we have actual royalty through the doors. This weekend, Adele Roberts (who you'll know if you get up very early in the morning) is running the London Marathon in aid of Heads Together, the mental health charity that The Duke and Duchess Of Cambridge also support. Scott Mills and Chris Stark got in touch with Kensington Palace to invite William and Catherine onto their show to surprise Adele and what do you know, they said yes. The royal couple surprised Adele who is running the London Marathon for charity. She had twigged something was going on, but she expected someone from The Only Way Is Essex to pop their head around the door. "I was thinking, is it Bobby Norris?" She said after the Duke and Duchess arrived. William and Catherine talk about their recent campaigning around mental health. "Also the power of a simple conversation," Kate added. "I met one young mother who said for her it was like medicine, it just shows you in moments like that how powerful just starting talking to people can be." They are both huge music fans, and Kate told us that the last gig they went to was Coldplay at Wembley. Going to events when you're as recognisable as William and Kate however, isn't all that easy. "Unfortunately it is a bit tricky. We've talked about going to Glastonbury before because I do love my music." "I'm probably at the edge of your age limit, i'm probably meant to go over to Radio 2 now, but i'm hanging on in there," he said. There are no rules when it comes to which BBC radio station you listen to, especially when you are an actual prince. 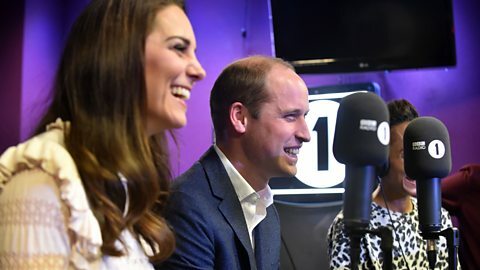 Prince William reveals that he texts Radio 1 using a fake name! 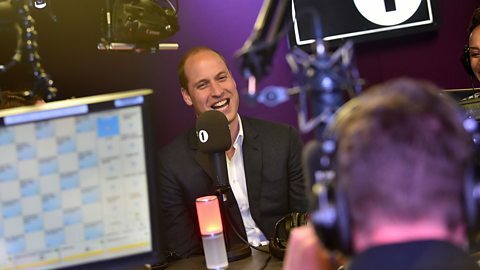 The Duke of Cambridge reveals that he texts the station anonymously. When the conversation turned to the subject of Innuendo Bingo, Kate seemed up for a round. "I haven't heard it, what's it about?" She asked. And does the Queen listen to Radio 1? 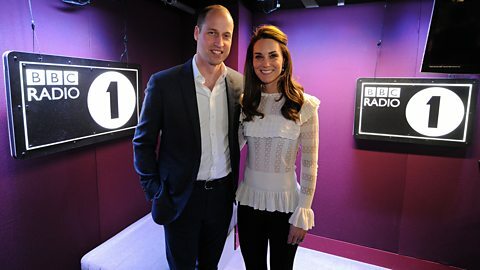 "She's definitely not a Radio 1 listener," said William. It was the Queen's 91st birthday on the day William and Kate visited Radio 1, but what do you get the most famous 91 year old in the country? Well, just a drawing from the kids will do. "It's quite hard to know what to give the Queen for her 91st birthday," said Will. "We've tried making things, now that we've got grandchildren around we've tried that and it always goes down really well." "Doesn't matter what it looks like, it goes down really well." One of the most important questions of the day: What do they watch on TV at Kensington Palace? "A lot of children's programmes," said William. "You have to pretend you're really interested because George gets quite upset if you're not paying due dilligence to the characters." "Fireman Sam has taken an awful lot of interest, George has gone past Peppa Pig stage, Charlotte will probably be into Peppa Pig soon." But when the kids are in bed, they do make time for something a little more mature. "We're both quite keen on boxsets. When we get time in the evening," he said. "We've watched Homeland, we're big fans. We've watched Game Of Thrones." Sibling rivalry occurs in every family and the royals are no exception. But what's their fast food of choice? "Curry, definitely. You do struggle for choice though," said Kate, adding that someone will go and collect their food because it's not easy to convince delivery drivers to drop off at Kensington Palace. 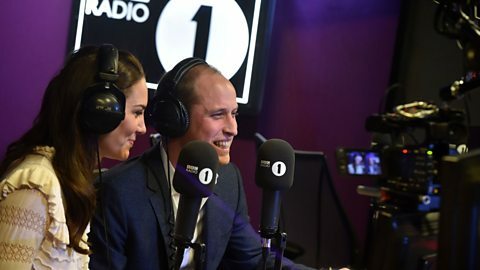 Greg James says he's glad this video exists because he "felt like he was dreaming" with William and Kate in the studio. Greg had some very special co-presenters for the Official Chart this afternoon.